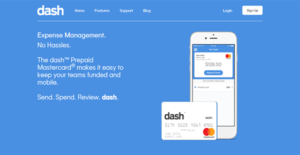 dash is a revolutionary expense management solution for businesses with its digital and physical prepaid Mastercard. This flagship product of Karmic Labs allows you to control your employees’ use of company funds, even when either you or your employees are abroad. With this flexible and modern solution, you can eschew traditional methods and cards for payments and expense management. dash simplifies the allocation and requisition of funds, as well as the approval of requests for additional currency. Moreover, dash is free to use. You and your personnel can download mobile-native applications in your preferred Android and iOS devices and begin setting it up without shelling a single cent. This makes the solution cost-friendly, especially for small- and mid-sized businesses. Traditionally, companies provide credit cards to employees with limitations, offer them cash, or promise to reimburse their expenditures. However, those are inefficient solutions. With dash, you can revolutionize funds allocation and expense management. You can do both, and more, in the cloud in simple interfaces and straightforward processes. Your employees can use the dash prepaid debit Mastercard anywhere in the world where they are accepted. This prevents situations where personnel have to spend their own cash on company expenses and request for remunerations afterward. Once allocated funds have been consumed, employees can make requests for additional money from the dash application. You and authorized approvers can see those requests and choose to approve them manually each time or automate approvals instead. Either way, you can be assured that every flow of money is transparent and recorded. Any time a member of your team makes a purchase, details are logged in the dash app. This way, you can ensure that your employees are using company funds only for approved purposes. Furthermore, employees can categorize their transactions to make it easier for the accounting unit and for the audit group to review and reconcile expenditures. In case of suspicious activities, you can easily suspend a user’s account. You can do this in dash with ease and choose to put that in effect as long as you need. What Problems Will dash Solve? Every year, businesses lose as much as $2,000.00 per employee due to inefficient expense management practices. This is largely due to countless hours lost on reviewing paper trails such as receipts and expense reports. dash can help companies take back the lost hours and money with its easy on-the-spot receipt capture. With this, there is no need for expense reports and for keeping physical copies of receipts for faster reviews. Because dash cards are prepaid, there is no need for businesses to arrange credit checks for every user. The solution only needs IDs for verification, as the company has stringent control over how much employees, new and old alike, get to spend. Additionally, this lets recent hires get productive immediately, especially if they need to be on the go. In case of theft or loss, a user can simply suspend their card from the app to avoid unauthorized expenses. This feature is also helpful to companies who have seasonal employees. Administrators can pause accounts during the time those personnel end their working period. Any remaining funds are then sent back to the company vault. Once they return, they can be reactivated to receive funds again without a hitch. Every enterprise is different, and may require a special Expenses Management Software solution that will be fit for their company size, type of clients and employees and even individual niche they cater to. We advise you don't count on finding a perfect solution that will work for each business no matter what their background is. It may be a good idea to read a few dash reviews first and even then you should pay attention to what the solution is intended to do for your company and your staff. Do you need a simple and intuitive service with just essential features? Will you actually make use of the complex tools required by pros and large enterprises? Are there any particular features that are especially useful for the industry you work in? If you ask yourself these questions it will be much easier to find a reliable solution that will fit your budget. The use of the application itself is free thus there is no enterprise pricing, though transactions such as expedited shipping of cards, paper statements, and paper check issuances are for a fee. Foreign transactions are also charged. We realize that when you make a decision to buy Expenses Management Software it’s important not only to see how experts evaluate it in their reviews, but also to find out if the real people and companies that buy it are actually satisfied with the product. That’s why we’ve created our behavior-based Customer Satisfaction Algorithm™ that gathers customer reviews, comments and dash reviews across a wide range of social media sites. The data is then presented in an easy to digest form showing how many people had positive and negative experience with dash. With that information at hand you should be equipped to make an informed buying decision that you won’t regret. What are dash pricing details? What integrations are available for dash? Dash is compatible with popular accounting systems as it can export transaction data into CSV, QuickBooks format, and Excel file. If you need more information about dash or you simply have a question let us know what you need and we’ll forward your request directly to the vendor.